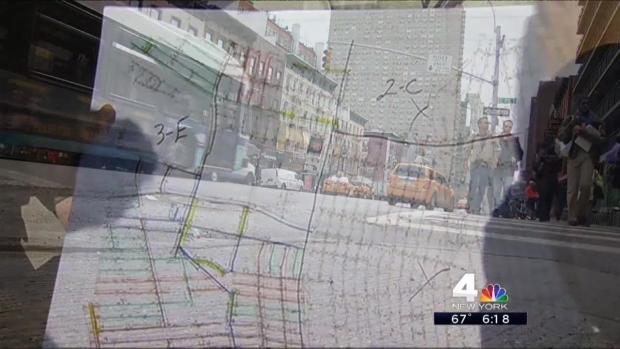 Two months after NBC 4 New York's I-Team found that utilities were keeping locations of natural gas leaks secret from the public, one gas company is reversing course. On Wednesday, National Grid endorsed an advocacy group-created map of Staten Island with hundreds of colored dots representing specific gas leaks along its underground system of gas mains and distribution pipes. "We're not afraid to allow the information to be published," said Susan Fleck, vice president of pipeline safety for National Grid. Data for the map was collected by scientists from the Environmental Defense Fund using methane detectors mounted on the same surveying vehicles used by Google to create street maps. After the I-Team revealed gas utilities are keeping lists of leak locations secret, a New York lawmaker is drafting legislation that would force companies like Consolidated Edison and National Grid to share where natural gas is seeping out of their underground pipes. Fleck said the data was presented to National Grid staff, which compared with the list of backlogged gas leaks the company has on Staten Island. "We did not collect the data or generate the study," Fleck said. "We played more of a validation role." National Grid's cooperation in the project marks a departure for New York-area utilities that have so far shunned efforts to publicize their long backlogs of gas leaks that have yet to be repaired. In New York, natural gas leaks detected more than five feet from a building are considered non-hazardous. Utilities must report the numbers of those non-hazardous leaks to the Public Service Commission, but gas companies are allowed to wait months or even years to repair them. Although the leaks may pose minimal threat of explosion, Mark Brownstein, chief counsel for the Environmental Defense Fund's U.S. Climate and Energy Program, said they pose a serious hazard for the environment. Some of the Staten Island gas leaks were found to emit daily carbon pollution on par with a car that travels between 1,000 and 9,000 miles. "It's not just that there is, say, three leaks on this particular block," Brownstein said. "We now know something about the rate of methane emissions coming out of those leaks and therefore can use that information to determine which piece of pipe we should replace first." In April, the I-Team requested both National Grid and Consolidated Edison provide a list of locations and severity of leaks awaiting repair. Both utilities declined to immediately share the information, but pledged to work with regulators on ways to be more transparent. Despite National Grid's endorsement of the Staten Island gas leak map, Con Ed remained noncommittal Wednesday as to when the utility might release locations of its backlogged gas leaks. "We want to do this in the right way, a way that appeases a lot of people's concerns. And I'm sure we'll get there," said Con Ed spokesman Michael Clendenin. Clendenin said Con Ed remains concerned that releasing specific leak locations might falsely alarm the public. He also stressed that hazardous leaks -- the ones within five feet of buildings -- are required by law to be immediately dealt with. "We've got thousands of leaks that are monitored that are not hazardous. Anything that is presenting a public hazard is fixed right away," Clendenin said.